There is no consensus on the investigation of these cases, owing to their rarity. We are presenting a case series of three cases of OPBC, which could be diagnosed only on magnetic resonance imaging (MRI) breast. Purpose of this presentation is to emphasize the role of MRI breast in these cases. A 76-year-old lady presented with a history of right axillary swelling, for 1 year. On clinical examination, she had a right hard and mobile axillary nodal mass. Ipsilateral and contralateral breast, as well as supraclavicular fossa, did not reveal any abnormality. On X-ray mammogram and B-mode ultrasonography, no lesion could be identified in either of the breasts. Tru-cut biopsy of the nodal mass revealed the presence of mucinous adenocarcinoma. Immunohistochemistry revealed ER +ve, PR +ve, CKT +ve. 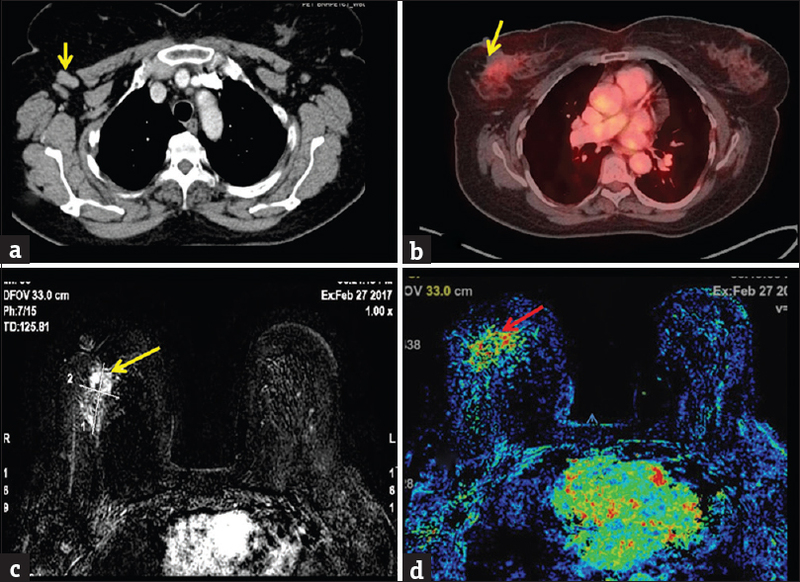 Positron emission tomography-computed tomography (PET-CT) revealed uptake in right axillary nodal mass but no other site of primary or metastatic disease. MRI was offered, and it revealed a 2 cm × 2 cm-sized area of mass-like enhancement in the superolateral quadrant in the posterior portion of the right breast (10 'o' clock) with micro lobulations. It was hypointense on T1-weighted and hyperintense on T2-weighted (T2W). T2W hyperintensity was probably due to its high mucin content. On dynamic postcontrast evaluation, the breast lesion showed heterogeneous persistent early intense enhancement followed by a progressive increase in signal intensity. Multiple foci of enhancement were also seen scattered in the right breast. 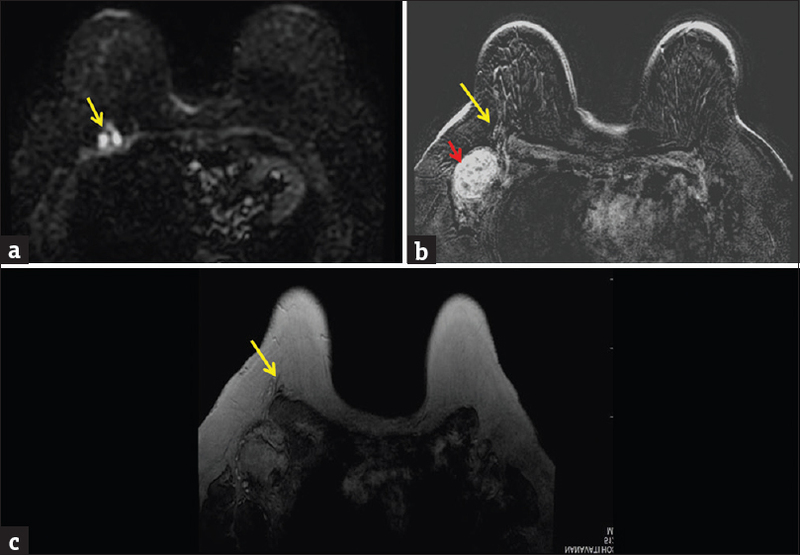 MRI features were consistent with the multicentric disease. A 59-year-old female presented with the history of right axillary swelling, for 8 months. On clinical examination, she had hard and mobile right axillary nodal mass. Ipsilateral and contralateral breast, as well as supraclavicular fossa, did not reveal any abnormality. On X-ray mammogram and B-mode ultrasonography, no lesion could be identified in either of the breasts. Tru-cut biopsy of the nodal mass was suggestive of adenocarcinoma. Immunohistochemistry revealed ER +ve, PR +ve. PET-CT revealed low uptake in right axillary nodal mass, but no other site of primary or metastatic disease. MRI was offered, and it revealed a regional area of nonmass-like enhancement in the central and outer portion of the right breast, measuring approximately 4.7 cm × 3.3 cm in size consistent with primary neoplasm [Figure 1]. A 65-year-old female presented with the history of right axillary swelling of 6 months duration. On clinical examination, she had a right axillary nodal mass of 5 cm × 4 cm, which was hard, matted, and mobile. Ipsilateral and contralateral breast, as well as supraclavicular fossa, did not reveal any abnormality. On X-ray mammogram and B-mode ultrasonography, no lesion could be identified in either of the breasts. Tru-cut biopsy of the nodal mass revealed the presence of malignant epithelial cells. Immunohistochemistry revealed ER −ve, PR +ve, HER 2 −ve. MRI revealed spiculated mass-like an area of enhancement in a posterior portion of the right breast, inferolateral quadrant at 8 'o' clock position, infiltrating chest wall on the right side (pectoralis major muscle), suggestive of the neoplasm [Figure 2]. There is accentuated regional non-mass enhancement in the outer half of the right breast, This pattern is often seen with infiltrating ductal carcinoma. OPBC with axillary nodal metastasis is a rare entity, first described by Halsted in 1907. In general, 0.1%–0.8% of all breast cancers are occult.,,, Optimum workup of the patient with OPBC is yet to be established. Although the primary imaging modality for evaluating breast lesion is mammography, a false-negative rate of up to 30% has been reported for mammography., The sensitivity of mammography further decreases in patients with dense breast parenchyma. MRI of the breast is a promising tool in such cases. It can identify primary tumor in 70% of patients of OPBC.,,,,, In addition, it was found that negative breast MRI predicted low tumor yield at mastectomy and hence could improve breast conservation rates in these patients. Olson et al. study revealed, 12 cases of metastatic axillary lymph node with negative MRI results, five underwent breast surgery, but no primary lesion was detected in four cases (80%). These findings substantiate the high sensitivity of MRI and its value in the clinical application. PET scan has revolutionized the management of carcinoma with unknown primary at other subsites. However, it has not been extensively evaluated in OPBC. In our case series of two out of 3 patients underwent PET scan, which did not reveal any site of primary disease. The purpose of presenting this case series was to emphasize the role of breast MRI, in metastatic axillary lymph nodes with unknown primary. MRI seems superior to other imaging modalities including fluoro-deoxyglucose PET-CT in cases of OPBC. Patel J, Nemoto T, Rosner D, Dao TL, Pickren JW. Axillary lymph node metastasis from an occult breast cancer. Cancer 1981;47:2923-7. Vlastos G, Jean ME, Mirza AN, Mirza NQ, Kuerer HM, Ames FC, et al. Feasibility of breast preservation in the treatment of occult primary carcinoma presenting with axillary metastases. Ann Surg Oncol 2001;8:425-31. Montagna E, Bagnardi V, Rotmensz N, Viale G, Cancello G, Mazza M, et al. Immunohistochemically defined subtypes and outcome in occult breast carcinoma with axillary presentation. Breast Cancer Res Treat 2011;129:867-75. Halsted WS. I. The results of radical operations for the cure of carcinoma of the breast. Ann Surg 1907;46:1-9. Couder F, Schmitt C, Treilleux I, Tredan O, Faure C, Carrabin N, et al. Axillary lymph node metastases with an occult breast: About 16 cases from a cohort of 7770 patients. Gynecol Obstet Fertil 2015;43:588-92. Harvey JA, Fajardo LL, Innis CA. Previous mammograms in patients with impalpable breast carcinoma: Retrospective vs. blinded interpretation 1993 ARRS president's award. AJR Am J Roentgenol 1993;161:1167-72. Majid AS, de Paredes ES, Doherty RD, Sharma NR, Salvador X. Missed breast carcinoma: Pitfalls and pearls. Radiographics 2003;23:881-95. Kilic F, Kandemirli SG, Er ME, Cingoz M, Velidedeoglu M, Ozturk T, et al. Primary angiosarcoma of the breast: Diagnosis with computer-assisted MRI-guided radio-guided occult lesion localization (ROLL) technique. Diagn Interv Imaging 2015;96:1203-6.
de Lima Docema MF, Costa PA, de Andrade FE, Bevilacqua JL, Elias S, Cerri GG, et al. Magnetic resonance imaging-guided occult breast lesion localization and simultaneous sentinel lymph node mapping. World J Surg Oncol 2014; 12:320. Aracava MM, Chojniak R, Souza JA, Bitencourt AG, Marques EF. Identification of occult breast lesions detected by magnetic resonance imaging with targeted ultrasound: A prospective study. Eur J Radiol 2014;83:516-9. Olson JA Jr., Morris EA, Van Zee KJ, Linehan DC, Borgen PI. Magnetic resonance imaging facilitates breast conservation for occult breast cancer. Ann Surg Oncol 2000;7:411-5.